I've always been ambivalent about the low-fi wall-of-sound brand of spacerock. Some of it is pure droning volume (e.g., Bardo Pond) and I have trouble listening to it, never mind enjoying it. Magnog occupies that portion of the low-fi universe in which the clarity of the instruments makes the music listenable, displays a lot of good ideas, but is challenged by the difficulty of taking the music beyond directionless jams. The band is from Edmonds, WA and consists of Phil Drake on guitar and delay, Jeff Reilly on bass, guitar, moog, and vocals, and Dana Shinn on drums, moog, and vocals. 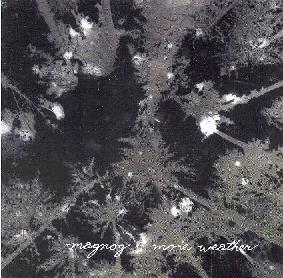 More Weather is the band's second release and is a 2-CD set of 4-track demos from 1994-1996. At it's best Magnog manages to capture the excitement of Syd-era Pink Floyd or raw jamming Guru Guru. The drumming is inspired and Drake is clearly capable of wrenching emotion from his guitar. On "Chopstick", for example, the spaceship guitar sounds are pure joy and Shinn brings a wild jazz rock element to his drumming. Unlike much of their music - which can be endless noise jams - the moods change dramatically throughout the song's 13 minutes. The bass is the weak link though, cranking out a limited set of notes in the plodding fashion of so many of the so-called shoegazer bands, and this is all the more noticeable given the strength that the guitar and drums can often display. A similar tune is "Ocean Floor Sleep" with its dreamy atmospherics navigated by the spacey echoed guitar. I love how Drake's guitar can be quietly spacey and trip along while Shinn wails away at his drum kit. It's a contrast that works well. Magnog's improvisational abilities seem to work best on songs in the under 15 minute range where they aren't forced to develop the music too much. There are two epics however. "Mystery Goodness" is 31 minutes and "Signatures" is 22 minutes. In these instances we hear lots of good ideas that pop out inconsistently leaving me thinking they would have been pretty potent tunes had they been shorter. Nonetheless, "Mystery Goodness" has some scorching guitar work and at times sounds like freaked out droning free jazz. This could have been a stronger set if they made it a best of their demos and limited it to one CD. There's definitely some interesting free jamming spacerock here, though I'd like to see a bit more variety. Still, for pure atmosphere this can be pretty strong stuff. For more information you can visit the Kranky Records web site.